I thought I’d stick the explanations for each of my visualisations here so that regular readers don’t have to wade through them every single time. The average number of shots taken or faced per match – a simple measure of how busy an attack or defence is. The average number of shots per goal scored or conceded – an equally simple measure of how efficient an attack or defence is. These can be cut and combined in various ways to summarise and compare the performance of a group of teams. Constant threat – teams that take more shots per match than average and are also better than average at converting them. Energetically wasteful – as for the previous quadrant, these teams shoot more often than average but are below average at converting them. 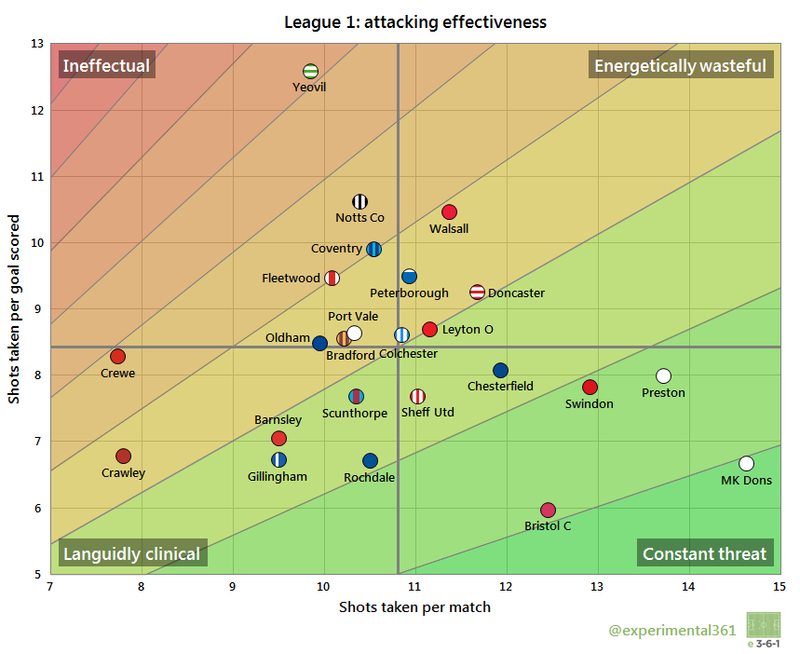 Languidly clinical – the flipside of “energetically wasteful”, these teams shoot less often than average but need fewer attempts than the average team to score. Ineffectual – the worst of both worlds, these teams take fewer shots than average and require more efforts to score each goal on average. Formidable – teams that allow fewer shots per match than average and have also withstood more shots than average side for each goal they’ve conceded. Competent but busy – teams that face more shots per match than average, but as for “formidable” sides they have absorbed more shots than average for each goal conceded. Languidly clinical – the flipside of “competent but busy”, these teams permit opponents fewer attempts than average but their defence requires a lower-than-average number of shots to penetrate. Pushovers – the worst of both worlds, these teams allow more shots than average and require fewer efforts to breach than the average. For shots taken vs. shots faced, the contours show where the ratio between shots taken and faced is constant. The borders of each stripe are where shots faced divided by shots taken changes by 0.1. For the other two graphics, where you have shots taken or faced on the horizontal and shots per goal scored or conceded on the vertical, the stripes show where the rate at which goals are scored or conceded is the same. Currently the edges of each stripe are 15 minutes per goal apart. A disproportionately high number of the shots they’re taking or facing are of a very high or very low quality. If the graphic is produced during a season, then the fixtures they’ve played so far may have been unusually easy or difficult. Luck also plays its part – the effect of injuries, tiredness, refereeing decisions and even just the bounce of the ball can all favour specific teams more than others in the short term. “number of shots”, does that include penalties?